One of the things that makes basketball such an amazing sport is that there are so many different factors to the game. There is size, skill, athleticism, etc., but there other factors like strategy, fight, and heart as well. A team that is able to fight and compete on every possession is going to be able to cover a lot of shortcomings. A team that is skilled and is also able to compete at a high-level is a few steps away from greatness. And, well some players are already more naturally competitive, it is something that can be worked on as well. It also becomes very infectious from one player to another in the right team culture. The basketball drills in this section are all going to be competition based. They are going to help players learn how to compete in all of the different aspects of the game. Along with working on competing though, these basketball drills are also going to work on specific skills as well. There will be drills to work on finishing, ball handling, defense, live ball situations, and more. 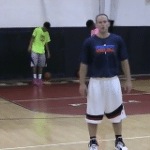 All of these basketball competition drills are in HD video and text format as well. This will allow you to be able to maximize your learning time. Also, like all of our basketball drills, these drills are instructed by an expert coach and demonstrated by high-level players. 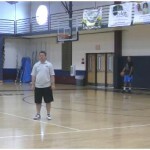 This will allow you to be able to see how to do the drill, while also receiving coaching instruction at the same time. Working on specific skill development drills with your team is great. That is a much-needed part of the game. It is also important though that your players are working on these different skills against live competition. This will allow them to practice what they learned, as well as better learn how to compete. Learning to compete is a skill just like dribbling or shooting a basketball is. Some players are better off at the start, but every player can become a better competitor by working on it. Hold each player to a high standard and require their best in everything that they do. Competition basketball drills are also going to give you better insight into who should be playing more minutes. Players that can compete at a high-level and also raise the level of the competition of the team should always be given a chance to play. Also, these basketball competitions drills will be able to help you raise the intensity of your practices. If you use one of these competition drills at the beginning of your practice (after everyone is warm), it will really set the tone. Or, if you feel like your team is not competing, break them up into sides and use one of these drills. It will help to refocus practice and get your player’s competitive juices flowing. If your team is able to compete in every circumstance no matter what, they are going to have a chance to win a lot of games. Every player on the team must have the mindset of, whatever it takes to get the job done. This is not something that just happens on its own though. You have to be willing to put the time in to develop this type of winning culture as a basketball coach. As a player, there is a lot of value in being able to play harder than everyone else. Yes, you need to be skilled and have a basketball IQ, but if you are also able to play harder than everyone else, you will really be able to distinguish yourself. 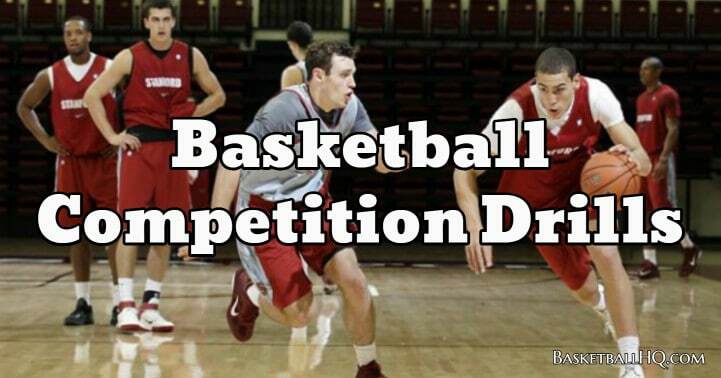 A great way to work on this is by using these different competition basketball drills. You will need a partner, but if you have a group of friends that want to get better, use some of them. Don’t waste your time playing sloppy games of pick up or 21, play some of these different 1 on 1 games with the various rules, and work on your game. 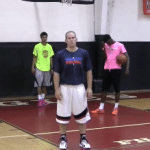 Competition based basketball drills are also a great way to work on different moves against a live defender. So if you have been working on a few different moves by yourself, a great way to practice them further is by using one of these drills. The live defender will allow you to fine-tune and master the different moves you have been practicing. Creating a culture of competition with your team is not an exact science, and it will be up to you as a coach to find what works best. You may want to emphasize a more rewards based initiative or one that has the losing team running. It will be up to you to find what works best for your team. Here are some teaching points that will help you better finalize what will work best for your team. It is important that when doing these drills, you are using controlled competition. As much as players should be giving their all, it needs to be controlled. Players need to make sure that they are not practicing fouling, being out of control, etc. If you watch the best players in any sport, you will see that they make everything that they do look effortless. Players can play their hardest without being out of control or fouling on every possession. Another big key for these competition drills is scoring and punishment. As a coach with your team, it is going to be up to you to find what best motivates your players. Whether it is a reward for the winning team/player or making the losers run, it will be up to you to find what works best. As far as scoring, most of the drills can be tweaked on the scoring. You have the ability to reward the defense for stops or make it an offensive based scoring system. Feel free to alternate or use whatever works best for your team. In a practice, this may not be as feasible, but in small group workouts, teaching is a must. As a coach, you must be a teacher as your players are competing. After a play is over, stop and explain what the player should have done in that situation. It doesn’t have to be long, but an explanation on different situations and moves will be essential in a player’s growth. With younger players especially, it will be hard for them to read a defender and also make the correct move. The better you can teach them how to think while they play, the better they will be able to use the correct moves while they are competing. This will also directly translate over to game-play. 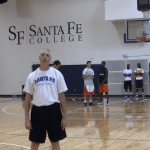 This defensive drill is going to work on ball pressure and being able to contain the dribble. It is also great for the offensive player as well. The 1 on 1 chairs wing closeout basketball drill is a great offensive and defensive drill for your basketball team, because the drill allows you to put together all of your offensive scoring moves and practice them against a defender. 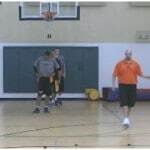 The dribble line basketball defensive drill will show you right away which players want to play defense and which ones aren't, because there is no help defense. The hawk basketball defensive drill is going to work on the players ability to guard one on one from the wing position. This 1 on 1 basketball closeout drill is designed to simulate going from being in the help side, to closing out, and guarding your man in a 1 on 1 scenario. 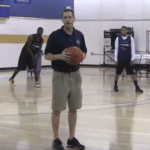 This closeout basketball drill is designed to work on plugging the gap , recovering out to your man, and then playing 1 on 1 defense, without fouling. This 1 on 1 post drill is great for working on developing both offense and defense in the post and will allow for some quality reps with competition. The 1 on 1 spot triple threat basketball drill is going to allow the players to play 1 on 1 from anywhere on the floor (3 point line area and in). 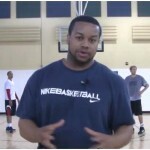 It will help them to practice scoring out of the triple threat and being strong with the ball. The one on one wing closeout basketball drill allows you to work on individual man to man defense as well as the different offensive basketball moves the players have been working on. 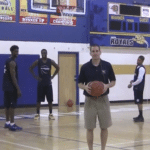 This competition finishing drill is going to work on what to do once you get an offensive board under the basket. It will work on finishing in traffic. This help and recover defensive drill is going to breakdown being in the help, and closing out on the catch. It is also great for competing in practice. 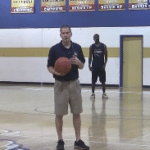 The 2 on 2 wing basketball closeout drill allows you to teach your players the basics of defense while also being able to determine which basketball players can guard and which can't. The bulldog rebounding drill is going to teach your player to compete and fight on the boards and when finishing in the paint. This finishing drill is going to work on finishing in a full court transition situation where a defensive player is trying to run you down. This 1 on 1 defensive drill is going to work on pressuring the ball full court. It is also going to really help the ball handler learn to handle pressure. The 1 on 1 help side recovery basketball drill breaks down the help side defense, works on closing out your defender, and then playing 1 on 1 defense. This defensive drill is going to work on being able to guard the ball from the top of the key and also being able to keep the ball out of the paint. 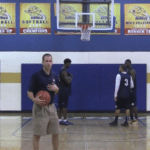 This basketball drill will allow the players to learn how to read their defender, sell their move, and practice making their moves at game speed. This 1 on 1 zig zag drill is going to help the player work on closing out and then playing live defense. It is also great for competing.